I have a new author Q&A post to share with you today! I was recently sent the book Royal Flush by Scott Bartlett. Scott was kind enough to get me a Kindle copy (it's a new age in book-reading) and I enjoyed it while on vacation! 1. Your writing reminds me of Christopher Moore's style: funny, irreverent and witty. Who have been your biggest writing influences? I'm afraid I've never read any Christopher Moore, though I've been encouraged by many to do so. My to-read pile is very jealous, however, and if they hear that I even breathed another author's name they are likely to attack me en masse. So please keep that between us. Douglas Adams has been tremendously influential, especially when it comes to my humour novel Royal Flush. Despite that Hitchhiker's Guide to the Galaxy takes place largely in space and my novel is set in a medieval nowhere-land, fans of Hitchhiker's should nevertheless feel at home reading Royal Flush. Adams taught me that the rules of fiction are highly breakable. In fact, they're practically asking for it. Otherwise, my influences include: Stephen King, from whom I learned it's okay to indulge your darkest curiosities; Chuck Palahniuk, from whom my writing contracted its occasional raw, cackling cynicism; Kurt Vonnegut, who taught me to confront life's grim truths with a joke; and Dave Eggers, who titled a novel A Heartbreaking Work of Staggering Genius, and proceeded to be even more brazen and inventive inside it. I apologize for the way I've punctuated that sentence. I happen to be a big Hitchhiker's Guide fan myself. 2. Do you have a routine that helps you write, or do you just wait for inspiration to strike? Inspiration is constantly striking, which is something I cope with using a notepad app on my smartphone. It's rarely the sort of oh-my-God eureka moment you're constantly hearing about--it's normally more like, "Hey, that would be cool in a story." Such moments can happen literally anywhere that is accessible to humans. Especially the bathroom. My 'routine' is in constant flux, and sometimes it evaporates entirely for months at a time--I hate it when that happens. Lately, on days I'm not working, my routine looks something like this: writing/editing in the morning, book promotion in the afternoon, exercise scattered throughout, and in the evening--when my mental processes have all but fled--I put on a podcast while playing a mindless video game. 3. What gave you the idea to write a medieval story? 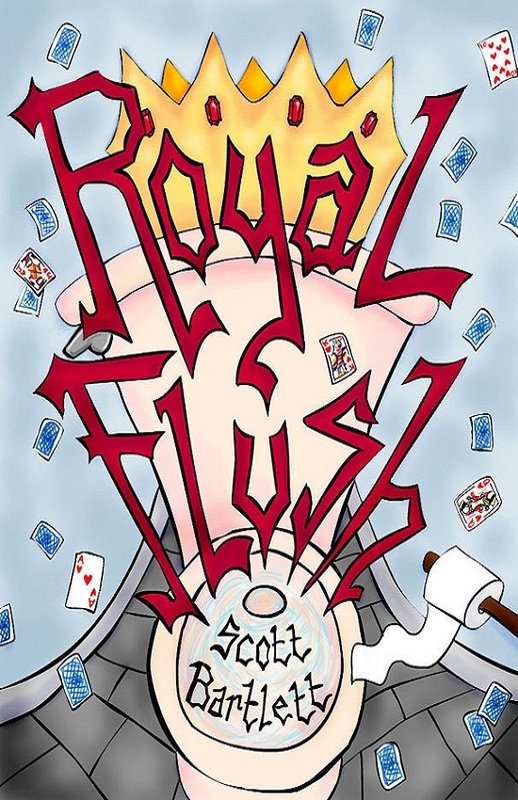 Royal Flush began as two-and-a-half short stories I wrote during high school and my first year of university. Those stories started with a single idea, which came to me in grade twelve as I walked up my road from the school bus. It was a scene in which a man demands that a woman standing nearby remove his heart using a surgical scalpel. The woman recently spurned him, you see. I would write the scene as comedic melodrama. She refuses to perform that particular operation, of course, but it still made me wonder what kind of man would feel he is able to command someone to do that sort of thing. I decided he must be a king. In fact, that’s his name--the King. It’s his only name. That makes no sense, of course, unless you employ a very warped logic. So I employed that warped logic to write the entire story. 4. In your book, The King has quite a knack for falling off of his rides. I can relate completely, as when I first started riding, my bike would not follow my instructions and often liked to go on without me as well. I have to know: is the klutzy aspect of the story autobiographical? I'm not as clumsy as I used to be, but I'm still pretty bad. Even though I've been cycling for years, I continue to wipe out on a fairly regular basis. I was recently riding to a party at a house I'd never been to before, so I consulted Google Maps. The route it suggested seemed completely backward to me, and I spotted one that seemed much more linear, choosing to take that one instead. At some point, the road I was pedalling on became a dirt road, which eventually became a dirt path that barreled downhill over incredibly rocky terrain. I felt in danger of wiping out, of course, but I also felt full of adrenaline, and so I applied the brakes far less than I should have. I lost control, and somehow my right handlebar was thrust into my upper right thigh. I lay on the ground yelling very loudly for a time, no doubt giving some nearby coyotes cause to wonder who the crazy human was. Eventually I got up and limped down the hill, walking my bike alongside me. When I reached the road, I forced myself to get back on and start pedalling again. It wasn't so bad after all, I guess. Two weeks later, I ran a 10-mile race. We are clearly kindred spirits. 5. How do you think The King would fare in triathlons? What would he do to ensure he won? The King is unused to physical exertion, but he's also very competitive. He would probably try something straightforward and misguided, like ordering all his competitors executed. That rarely works out for him, but the King isn't very subtle, so I'm not sure what other courses of action he would have at his disposal. He would likely try to imprison his competitors next, and if that didn't work, he would try to convince anyone that would listen to waylay them. If none of that worked, he'd be at a complete loss for what else to do. Here's a direct quote from the book, which I think sums up the problem here nicely: "This was irksome. He had never been faced with a problem he couldn't have executed." 6. Do you have any stories of athletic prowess to share with us? As I mentioned, I ran a 10-mile race a few weeks ago. That's probably the biggest thing. I don't plan to get into running seriously, though--I merely wanted to run the race, to have done it. If that makes any sense. Other than that, I just try to keep generally fit, using a variety of means. Over the years I've cycled, played sports, studied Kung Fu, lifted weights, performed bodyweight exercises, sprinted, ran, gone on hikes, climbed rock walls, played paintball, went swimming, and done various other things to keep fit. If I try doing the same thing over and over I get bored and I don't stay fit. 7. A little birdie told me you used to draw stick figure comics. Any chance for a comeback?? I'm kind of partial to stick figures. There might have been, if XKCD wasn't already doing such an awesome job of it. That's not to say Randall Munroe has a monopoly on stick figure comics, of course. It's just that my biggest lesson from making those comics as a kid (which featured my friends and I with superpowers) was that I love to write. The pages were mostly dominated by speech bubbles laden with dialogue. It now seems more efficient to skip the drawing and just get right to the writing. My writing is very dialogue-heavy, which I attribute to all those comics I made. Ah, for a friend! I see :) If your 'friend' is anything like me, self-publishing will turn out to have been more work than he or she is currently anticipating. Writing the book, properly editing it, designing the cover art or finding a cover artist, formatting it, setting up all the necessary accounts, promoting, and all the other things involved--these tasks have eaten up hundreds of hours of my time, and have involved some reasonably steep learning curves. Thanks so much, Scott, for stopping by my blog today and answering my questions so thoroughly! I sincerely enjoyed your book and I think it's a great read for lovers of the comically absurd. Best of luck on the rest of your blog tour! As for all you wonderful readers, if you'd like your funny bone tickled, you can check out the book on Amazon! It's where all the cool kids are self-publishing these days! *Disclaimer: I was sent the book in exchange for the Q&A post, but the questions and opinions (and drawings of course) are my own. Very cool q and a! I checked out the amazon link - the book sounds very cute. Well I definitely share his influences and his answers were pretty great. I'll have to see about getting it in some form other than e-reader, though. Maybe I'll order it, print it, then read it that way. Gia: Thanks! Yup, it's a fun book! Pickleope: I knew you'd share his tastes :) You can buy the actual book in paper form too! Gia: I'm glad you think so! Pickelope: They're good influences! They've yet to lead me astray. Except maybe Chuck Palahniuk a few times, but lessons were learned. Gia and Pickelope: If you end up checking out the book, I'd be eternally grateful if you could rate it on Amazon, or wherever you buy it. That's how indie authors get publicity! TriGirl: Thanks so much for having me on the blog! I'm so happy with the way this interview turned out. The animations had me cracking up. Other Tri-ing to be Athletic readers: Jump on into the conversation! I'd love to continue chatting with you guys. Influenced by Douglas Adams eh? I might have to check this book out myself. Scott: It was a pleasure to have you here! Christopher Moore is my absolute favorite author. I'm going to have to check this out since you said it reminds you of his stuff! runningonwords: This is why we get along :) Christopher Moore makes me actually laugh out loud. My husband could not stop reading passages to me from the first book he read (Lamb) and he never does that. We've both been fans ever since. If I can laugh while reading a book, I'm in. DWei and runningonwords: if you check it out, I'd love to hear what you think! Let me know on Twitter @ScottTBartlett, or on my blog!